In the West, Capcom’s Monster Hunter series has enjoyed its fair share of popularity… though when Western gamers are asked about top-tier franchises, the average gamer would most likely mention titles from series like Final Fantasy, Assassin's Creed, or Call of Duty before even mentioning Monster Hunter. In Japan though, Monster Hunter is a widely popular household name after cementing its fanbase during the PSP’s boom. Though the series has never been a monumental hit here in the West, it did garner a strong (albeit niche) fanbase, especially with their releases on Nintendo’s 3DS handheld. Monster Hunter World looks to transform that niche fanbase into a powerhouse fit to rival some of the gaming's biggest titles. Monster Hunter follows a unique flow, its that cycle that made past titles so popular among fans. 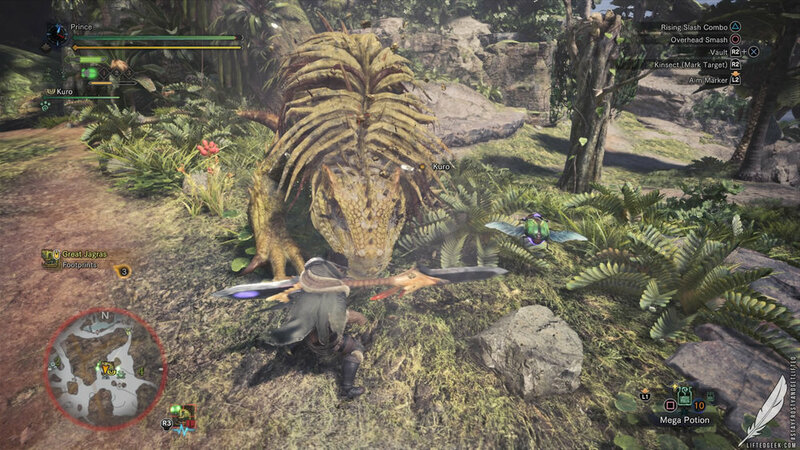 Monster Hunter is not an easy game, it doesn’t hold your hand, if you aren’t careful you could easily get wiped by a monster you’ve taken down dozens of times before. 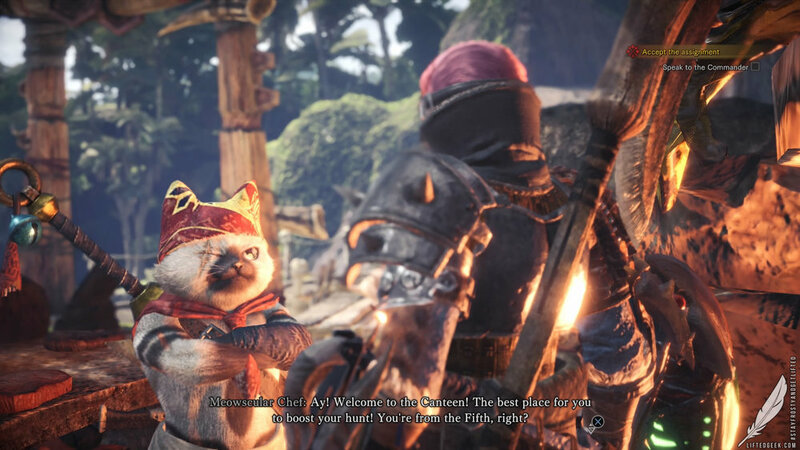 Monster Hunter World provides the tools to bring your hunter to life with a robust character creation system and even the ability to fully customize your Palico, a hunter’s feline companion and support character. You are a hunter, part of the fifth wave of hunters traveling from the Old World to the New World. Before landfall, your ship is taken down by a massive Elder Dragon the size of a small island that looks like a giant volcano covered in volcanos. We learn that this creature is Zorah Magdaros and the rest of the main campaign is spend determining why massive Elder Dragons are migrating to the New World in alarming numbers. Unlike a traditional RPG, your progression isn’t built into an arbitrary leveling system. To be stronger or hit harder you have to get the gear. Upgrading and forging weapons and armor IS the leveling system, with the materials you use carved from very monsters you're hunting. This is the core of the aforementioned cycle of gameplay, basically you hunt/carve/repeat to essentially "level up" you character. There is a rank system that's more so tied to what you've done rather than what you are wearing, follow the story and you Hunter Rank (HR) will rise, opening up more hunts to partake in. Hunts are presented either as story-driven or optional/side missions. The materials you earn after a hunt are never guaranteed, I can attest to how frustrating it can be to realize you are just one item away from crafting a sick set of armor… only to have to hunt the same monster five times just to get it to drop. Carving monsters you hunt operate like the loot boxes that are oh so popular among other games today, the difference is that unlike other games *cough* Battlefront II *cough* that try to give the player a sense of “pride and accomplishment” in a convoluted gambling system (plus taking ya hard earned cash), taking down a Rathalos and finally putting together that sick new weapon you’ve been coveting gives players a very real sense of pride and accomplishment. Past titles always created a sense of fatigue when replaying missions. 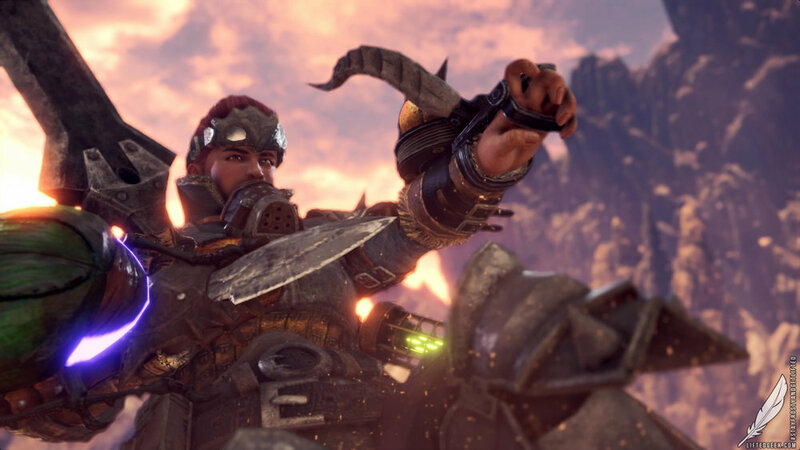 Crafting and hunting are the key elements of the Monster Hunter series and what World does better than any of the previous titles is to create a steady flow of missions outside of the main campaign. After discovering a new monster, you begin to generate assignments from the resource center. Assignments are like sidequests, specialized missions outside the main storyline giving the player another chance to take down a specific monster. Another bit that Monster Hunter World improved upon is the mission types. Past titles had missions that ranged from hunting down a big monster to collecting a specified amount of material. Gathering missions always felt like a slog, popping you into the world to dig through the grass. The new bounties mechanic changes this up considerably; instead of forcing the player into a full mission to collect bones or honey you can now activate bounties and fulfill them while out on another quest. 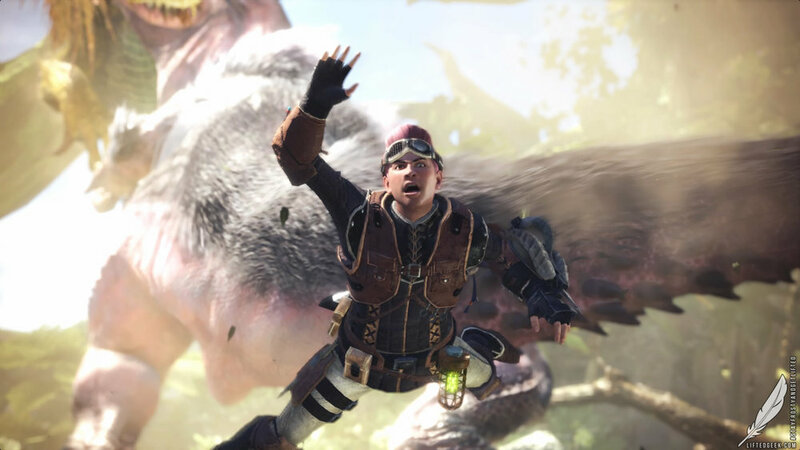 This shift in gameplay greatly streamlined the experience, allowing Monster Hunter vets to jump right in to what makes the series so great… hunting monsters. Making the leap from being a predominately handheld title, this is the first console Monster Hunter game since Monster Hunter 3 Ultimate (WiiU) but even that was just a remaster of the 3DS version which was an expansion of Monster Hunter Tri (Wii). Monster Hunter’s jump to current gen greatly improves on the game’s otherwise flat locales. From the lush setting of the Ancient Forest to the macabre environment in the Rotten Vale, every detail in the world is ramped up. No longer are zones separate sections on a larger map, but rather the whole map is at your fingertips without a loading screen in sight. Zones are still available on your map, but these feel more like they were meant for players to better coordinate with party members. Maps are considerably larger, not just in surface area but in how high up… or deep… they go. Navigating can take some getting used to, in my first couple hours I found myself lost more often than not. Getting around this brave new world would have been more frustrating if it weren’t for the scout flies. Speaking of scout flies, while exploring the map you discover artifacts left behind by monsters, these range in variety from footprints to gashes on trees. Each track you discover fills up a research meter for that monster and when you get it high enough the scout flies help lead you to your target. The more you research a monster, the more accurate the scout flies become. Early on, you mostly can be pointed in the right direction, but eventually the scout flies can evolve to be so accurate that it pinpoints you to where a monster is escaping to and even allows the mini-map to display useful details like when the monster is near death. The sheer size of these worlds were made for exploring. Missions are all saddled with a strict time-limit, generally 50 minutes. Outside of assigned, optional, and investigation missions; you have the option to go into expedition mode to open up exploration options. While on an expedition you can do everything you were able to do on a mission without worrying about running out of time. Looking to clear a few bounties or take down a couple Anjanath to turn into fancy trousers? You can do that here. While bounties can be completed during the aforementioned time-limit missions, after completing a mission you can choose to be transported back to the your HUB world or continue on that map in expedition mode. Monsters do behave a little differently during expeditions; unlike standard missions where a monster generally stays on the map, in expedition mode you can take a monster down to near death but if you can’t land the killing blow or capture it in a timely manner… said monster can just leap away from you, leaving the map entirely and negating all the work you put into fighting it. Speaking of combat, what makes Monster Hunter such an engaging franchise is in the mechanics of the gameplay. With 14 weapon types at your fingertips you can play through the whole game using one then instantly change up everything about the gameplay’s combat system just by picking another. Every weapon is viable in Monster Hunter and as you start a new game you are given a starting weapon from each of the 14 types. Whether you take the Sword and Shield or opt for a more technical weapon like a Switchaxe, there is no definitive “best weapon” in the game. Of course, Charge Blade mains will always say theirs is best… same with Insect Glaive users (like myself). What matters here is in how the player utilizes the weapon. 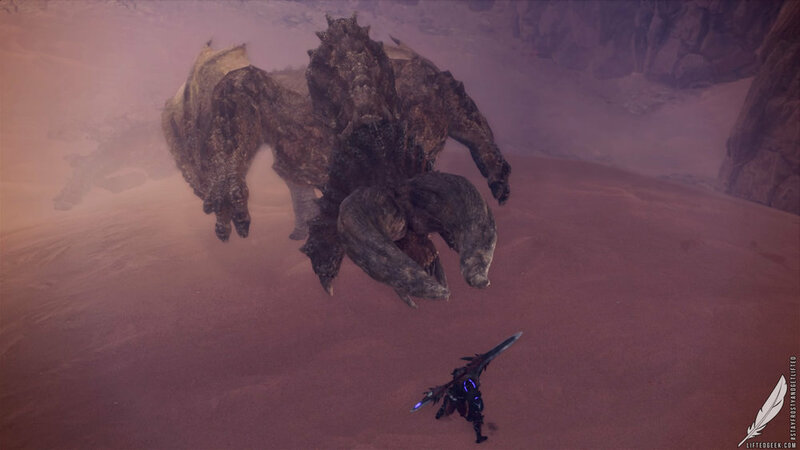 For example, some weapons like the Hammer or Hunting Horn work very well against heavily armored monsters, but these living tanks aren’t without their vulnerable spots. If the weapon you choose simply bounces off heavily armored foes, it's your duty to find parts of the monster you can attack… like say if it has a soft underbelly or if its head isn’t as heavily armored. All combat, even ranged weapons, rely on mastering the game’s combo system. These combos differ from weapon to weapon but if you’ve ever played any third party action games these should feel familiar. Several quality of life changes to the core gameplay improve on many of the shortcomings from past titles. You can walk or even run while consuming items requiring a cast-timer, like potions and antidotes, and actions that hinder your movement can be cancelled with a well-timed dodge. Before, if you began sharpening your weapon mid fight during an inopportune time you’d have to take the hit if a monster rushed you… now all you gotta do is dodge and you’ll cancel out the action and escape an otherwise unfortunate situation. Speaking of sharpening, for those who haven’t played a Monster Hunter game before, your weapon gradually dulls during the course of a fight. Whetstones were previously a consumable item in Monster Hunter games but in World this item is no longer a consumable but part of the core kit. Other previously consumable items like bug nets and pick axes are also no longer relegated to an item you had to come into battle with or craft in the field. Crafting items is just as straight forward as it was in previous titles, but the biggest time saver is the ability to auto-craft certain items in the field. If you find yourself using mega potions quite frequently you can have the system automatically craft them whenever you pick up the required resources. Another major change is the ability to eat a meal in camp, manage your inventory out in the field, and even fast travel to your unlocked camp sites. There is so much to love here and while some Monster Hunter purists want to call these quality of life changes “pandering to casuals,” I digress and feel like these are positive changes for all players whether this is your first MonHun or fifth. you're gonna love the Palicos! 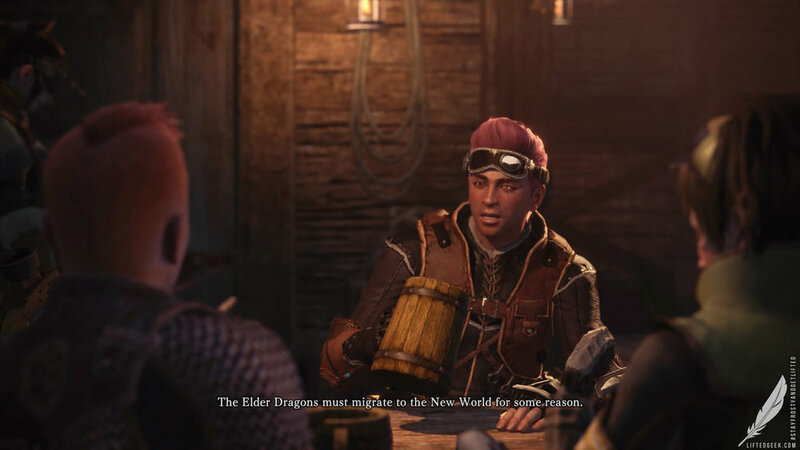 Monster Hunter World goes above and beyond for the new player, your handler continually drops tips during exploration, whether you need to dodge heavy attacks or during the very first time you have to capture a monster instead of slaying it. Even when you take a new weapon out in the field the familiar voice of your team leader echoes with tips on how to wield it, the game even provides useful button prompts in the upper right hand corner. Previous titles front loaded this information with text tutorials, something that I feel doesn’t convey the information as well as real-time application. While making the game more accessible is a great move for the franchise, there are times where I feel they could have executed teaching new players the ins and outs better. This game is still an incredibly challenging game and it doesn’t matter whether you’re playing Dark Souls or Cuphead, constantly losing can be pretty demoralizing to new players. Though, the devs have done enough in my opinion and most of the responsibility on improving in game should be on the shoulders of the players. On top of the already solid combat system, the series does manage to bring something new to the table. Your slinger acts as a ranged weapon, a wrist mounted slingshot capable of shooting everything from rocks you find on the ground to special flash pods to blind monsters. The slinger also acts as a grappling hook, though a bit of a letdown to this mechanic is that using the grappling hook is limited only to when you see certain points you can hook on to in the map. These points aren’t nearly as numerous and I feel like this was a bit of a missed opportunity for hunters who favor aerial maneuvers. The new mantle system and Palico tools also add a new layer to preparing for combat. Mantles are pieces of equipment you can activate and have a considerable cool-down until you can activate again. These mantles have varying affects from making your hunter more stealthy to giving you the ability to glide. Palico tools are found when completing certain missions, you start the game with the Vigorwasp tool and find various others in your adventures. These tools are activated automatically or you can manually call on your Palico to activate them if it’s off cool-down. Online co-op is handled quite well here, but could use some improvement. Guild missions are now a thing of the past and other players in your session can jump into any mission from assigned story missions (as long as the joining player already completed it) to investigations. If you find yourself struggling during a mission you can shoot an S.O.S. flare to draw the attention of other hunters. When browsing available missions, hunters online can specifically search S.O.S. requests to help out. 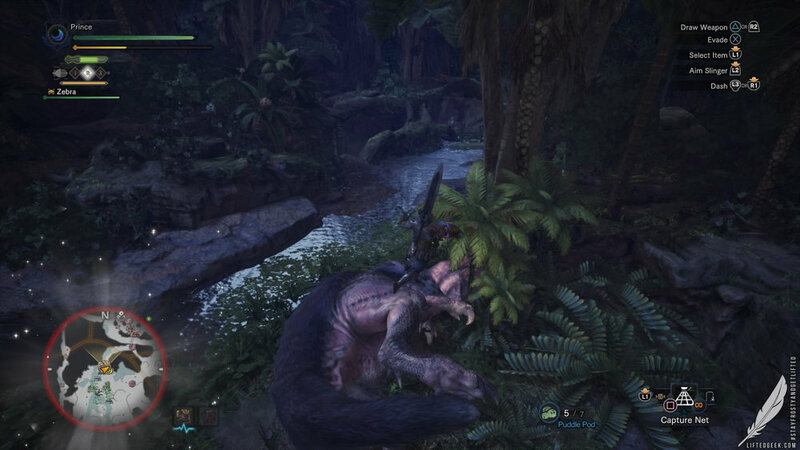 Monsters are tuned depending on whether you are hunting solo or multiplayer, creating a challenge when you get a full party of four while making sure solo hunters don’t feel overwhelmed. My one and only major criticism is in the narrative and all it came with. If you are looking for a deeply woven story with engaging lore and likable characters… this may not be the game for you. Monster Hunter has always been gameplay first and narrative second. While they have made great strides in this title and arguably this is the best Monster Hunter story to date, it still pales in comparison to much of the story driven games available today. While language can be changed to play the game in the original Japanese audio track, the English dub is both good and bad at the same time. Featuring performances from the likes of Eden Riegel (Final Fantasy XV, Persona 5), Matthew Mercer (Let It Die, Overwatch), and Richard Epcar (Street Fighter V, Injustice 2) the performances were quite good… about as good as what I’d expect from a decently cast anime dub… but literally none of the dialog matched with the lips. While the story had a strong start, your “battles” with Zorah Magdaros proved to be some of the most boring set pieces in the game. I’ll take fighting a Diablos with an angry Bazelgeus carpet bombing my entire party over the game’s two Zorah Magdaros sequences. Luckily, these story missions are short and I feel did not impact my enjoyment of everything else. Hands down a great time and a game I am still currently playing almost daily. Monster Hunter World is a revelation, an example of a gamble that paid off wonderfully for Capcom. Having already sold millions of copies with first week Japanese sales over 1 million (a new record in Japan) with PS4 sales to date racking up 1.5 Million and Xbox One sales taking PUBG’s top spot. I love my time as a hunter and I still play it now, having sunk my teeth into high rank missions I embark on my journey for new loots, stronger gear, and all the memorable moments hunting really big dragons. The push to make the game accessible to newcomers does not alienate vets. 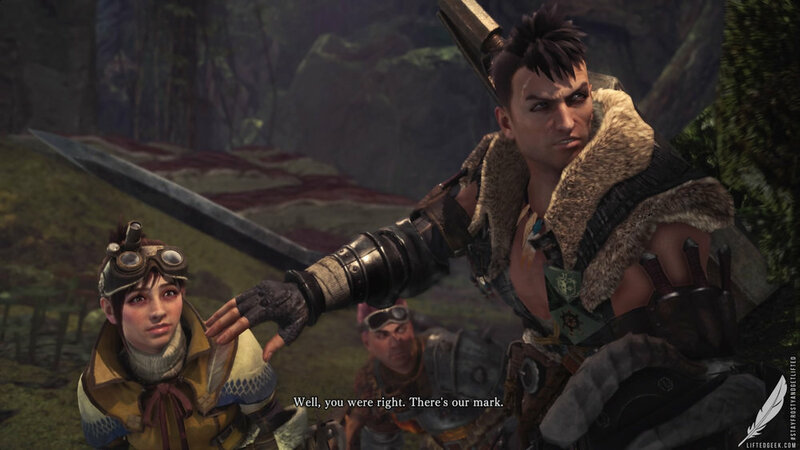 Monster Hunter World retains everything that made previous titles so challenging while improving on the game’s core formula from the ground up… anyone who says otherwise is just a salty apologist unable to criticize the past games for where they fell short. Time for this series to shine!